From left to right: Laura Robinett (Director of Alumni Relations), Deborah Whitt (Communication Arts Department Chair), Kevin Armstrong (CEO of the Wayne State Foundation), Matthew Hines (Supervisor of Gas Operations, Black Hills Energy), David Whitt '89, Brandy Johnson (Community Affairs Manager, Black Hills Energy), and Ron Whitt (communication professor emeritus). In return for presenting a workshop to Black Hills Energy employees, David Whitt '89 selected WSC as his charity of choice for the company's $2,500 donation. Black Hills Energy recently gave $2,500 to Wayne State College after David Whitt, a 1989 alumnus of Wayne State College, presented a staff development workshop for the company’s employees. In return for the workshop, the company offered to support a charity of Whitt’s choosing. Whitt decided to support his father’s scholarship at Wayne State, which is awarded to a student majoring in speech communication at WSC. 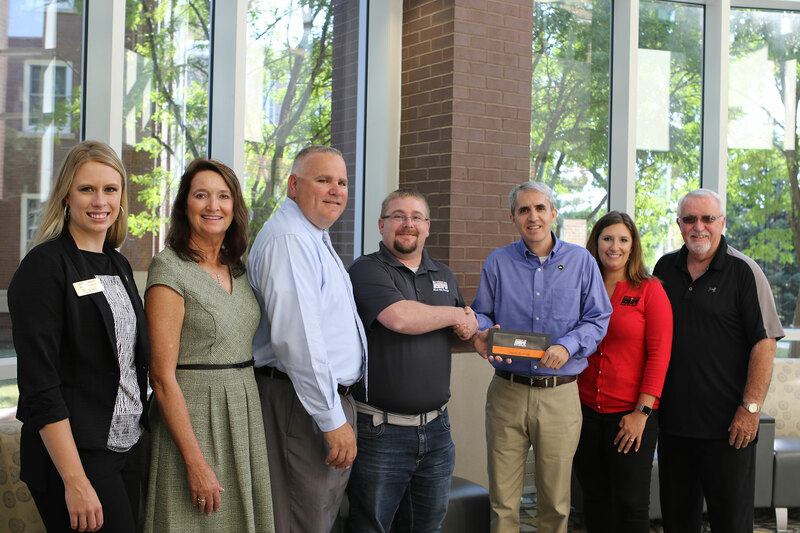 Black Hills Energy representatives visited campus in August to present a check to the Wayne State Foundation supporting the Dr. Ronald Whitt Endowed Speech Communication Scholarship. Matthew Hines, Supervisor of Gas Operations in Norfolk, Neb., and Brandy Johnson, Community Affairs Manager in Lincoln, Neb., attended along with Whitt. Whitt graduated with a bachelor’s degree from Wayne State, majoring in speech communication/communication studies and corporate and community relations. He is a professor of communication studies at Nebraska Wesleyan University. Whitt’s father, Ron Whitt, a 1967 alumnus of Wayne State and retired communication professor, started teaching at Wayne State in 1981 and retired in 2016. Whitt’s stepmother, Deborah Whitt, a 1979 alumna of WSC, is also a communication professor at Wayne State and chair of the Communication Arts Department. Black Hills Energy has also been supporting the Black Hills Energy Annual Scholarship at Wayne State College since 1997.